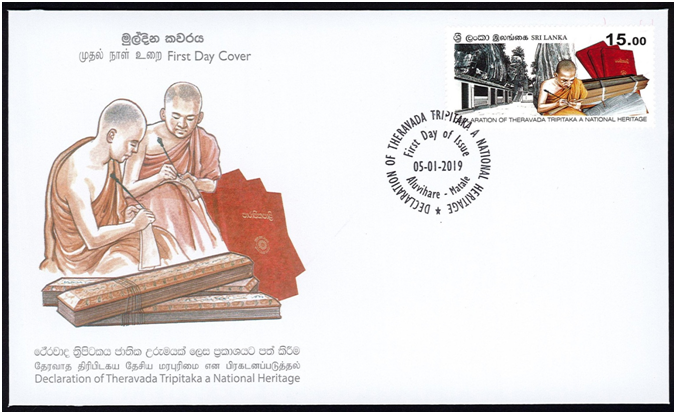 Declaration of Theravada Tripiṭaka a National Heritage. The term Tripiṭaka (Pali. Tipiṭaka) literally means 'three baskets,' but signifies three sets of Buddhist canonical scriptures. In Buddhism, Tripiṭaka consists of Sutta (Skr. Sūtra), the discourses of the Buddha, Vinaya, monastic disciplines, and Abhidhamma (Skr. Abhidharma), a sophisticated philosophical analysis of the Buddha's teachings. This Tripiṭaka was transmitted orally, but in a deliberately organised system. Buddhists seemed to be interested in scribing what they have orally preserved for a long time, but culminated their attempt around first century BCE. This wonderful and momentous event occurred in Sri Lanka! Today there remain three versions of Buddhist Tripiṭaka; Pali Tripiṭaka, Chinese Tripiṭaka and Tibetan Tripiṭaka. Among these three versions, Pali version represents the oldest Tripiṭaka, which is identified today as 'Theravada Tripiṭaka,' for it was compiled following the redaction of senior Buddhist monks (thera). According to Theravada tradition, two Saṅgha Councils, a body representing only senior monks (thera), were organised in due time and due places to refine Tripiṭaka texts. Third Saṅgha Council was arranged at the time of emperor Aśoka (c. 268 to 232 BCE) under his patronage to resolve various rivalries and the doctrinal issues prevailed at the moment. Here gathered 1000 senior monks. 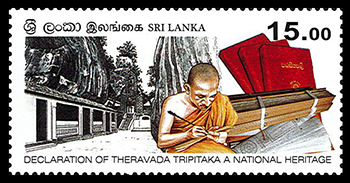 The Tripiṭaka, redeemed and reformed by this third Council, was introduced to Sri Lanka by arahant Mahinda thera, the elder son of emperor Aśoka. Henceforth, Sri Lankan Buddhist monks launched their mission of protecting this Tripiṭaka. Famine in the first century BCE is the most hardship ever experienced by Buddhist monks in this Tripiṭaka preservation enterprise. Many monks sacrificedeven their lives while memorising Buddha's words in starvation. Some left the land with the promise of retuning after the famine. However, at the dispelling of the famine, with the intention of avoiding similar disasters in the future, the Buddhist monks in Sri Lanka foregathered at Ālokaleṇa (modern ĀlokaVihāra located in Matale District, Sri Lanka) and started writing Tripiṭaka with commentaries for the very first time in the history of Buddhism! Mahāvaṃsa testifies that this historic moment relates to the period of king VaṭṭagāmiṇiAbhaya's second enthronement (c. 89 – 76 BCE). History of Sri Lankan Buddhism has not flowed down evenly and smoothly. Non-Buddhist invasions, non-Buddhist religious upheavals, and political upheavals were repeatedly threatening the regular course of Buddhism in the land. Besides, natural disasters like droughts, famines, floods and even tsunamis attacked again and again. In every catastrophe, Buddhist monks managed to preserve the Tripiṭaka at any cost, sometimes paying the price by their lives. Apart from commentaries, Tripiṭaka comprises following texts. There are some controversial points regarding the authenticity of Theravada Tripiṭaka. Less controversial approach to Theravada Tripiṭaka is through historical linguistic analysis. Pali language in Tripiṭaka sometimes shows more archaic word formations and sometimes some recent formations. Therefore, in historical linguistic point of view, language in the Tripiṭaka can be dated 5 – 2 centuries BCE. Hence, in conclusion, it should be remarked that, with due patronage of Sri Lankan kings, rulers and people, Sri Lankan Buddhist monks have preserved the Buddha's teachings with its least modifications, if not the originals. This is called 'Theravada Tripiṭaka' and it is indeed an Honour to Sri Lankansand a true National Heritage of them.